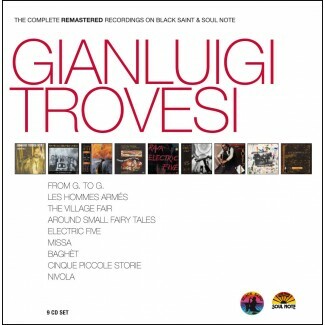 Includes: FROM G. TO G., LES HOMMES ARMES, THE VILLAGE FAIR, AROUND SMALL FAIRY TALES, ELECTRIC FIVE, MISSA, NIVOLA plus BAGHET and CINQUE PICCOLE STORIE previously unreleased on CD. THE COMPLETE REMASTERED RECORDINGS ON BLACK SAINT & SOUL NOTE is a monographic box-set collection aimed at recounting the most beautiful chapters that revolutionised the history of jazz. This new series was launched in March 2010 with the simultaneous release of four box-sets, including albums by some of the artists who participated in the success of the outstanding labels. A philological work, beginning with the original recordings on multi-track master tapes, patiently integrally remastered paying strict attention to the sound quality.